Click on emblem for more info on it. The content of this website is for general information purposes only and does not constitute advice. This website tries to provide content that is true and accurate as of the date of writing. However, there is no assurance or warranty regarding the accuracy, timeliness or applicability of any of the contents. Visitors to the website should not act upon the content or information without first seeking confirmation from the appropriate Village Department if applicable. The information at this website might include opinions or views which are not necessarily those of all Village Employees or Council Members. 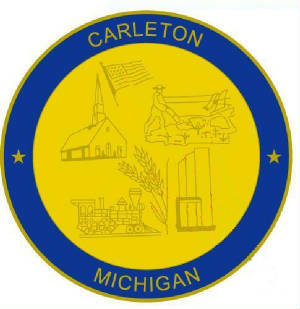 "Village Of Carleton excludes liability for any claims, losses, demands or damages of any kind whatsoever with regard to any information, content or services provided at this website, including, but not limited to, direct, indirect, incidental, or consequential loss or damages, compensatory damages, loss of profits or data or otherwise."